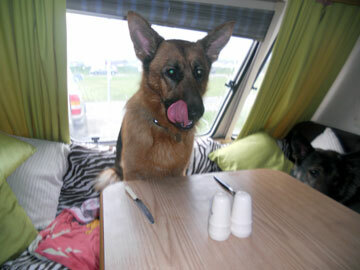 This is the photo of my GSD Jess in our caravan waiting for her dinner. She is 22 months old and a very lively clever pup. She has basically taken over our lives, and we wouldn’t have it any other way. What a cute picture of your baby, Jess. You are definitely right, German Shepherds are incredibly clever, intelligent, smart - you name it. Just when you think you've seen it all, they'll come up with something new to impress or entertain you. I can personally say, as long as I've been around German Shepherd Dogs, that I don't think I'll ever see it all because these are thinking dogs that not only do tricks but they can even create them on their own too. Exactly as your girl Jess has done here. Please keep us up on her successes, growth, development and everything else as she grows up. Such a smart girl, your German Shepherd Jess, is everything you'd want in a GSD - good looks and brains too! Hi, Annette-- your Jess is very cute, and confident about her place in your caravan! We spend half the year in our travel trailer, and have just gotten a GSD about Jess's age. She has spent a couple of nights in the trailer, but not an extended period, and we are looking for tips to make her trailer time go smoothly. Have you had dogs before there? The other half of the year she is on a large property where she can run freely, so it is going to be quite a change for her, to have to be on a leash almost all the time. Very Pretty girl Jess is! Great photo wish you had a couple more. She has the World by her Paws, on the go, traveling - good for her. Take care of your Girl and she will take care of you!